Tags: A. A. Daniel; A. A. Myers; A. B. Tedford; A. C. Hart; A. C. Turner; A. Flourny Jernigan; A. J. Metcalf; A. P. Farnell; A. R. Metcalf, Jr.; A. Solaria; Alex Lawton; American Civil War; Amerindian; Andrew Aulin; Andrew Aulin, Sr.; Andrew Lawton; anniversary; Apopka; Argo's Store; Arthur Scott; B. F. Ward, Jr.; B. F. Ward, Sr. R. F. Cooper; B. F. Wheeler; B. F. Wheeler, Jr.; B. F. Wheeler, Sr.; B. Z. Hunter; Baptists; Basil Mays; Beasley; Benjamin Franklin Wheeler; Benjamin Franklin Wheeler, Jr.; Benjamin Franklin Wheeler, Sr.; Billie Buster; Brewster; Broadway Street; Brush Arbor; C. A. 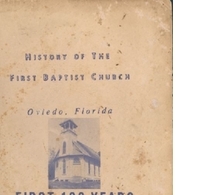 Love; C. D. Weaver; C. F. Rolquist; C. J. Broome; C. K. Buckelew; C. W. Holder; Caloosa; centennial; Charles Simeon Lee, Jr.; Christian; Christianity; Chuluota; Chuluota Baptist Church; churches; citrus; Civil War; clergy; Clermont; Clifton Springs; colonization; colony; Creek; D. D. Gammage; Dan F. Thomas; deacon; Delco Light Plant. Goldenrod; Diane Aulin; Diane Aulin Keller; Donald L. Orman; E. A. Farnell; E. Lee Smith; education; enterprise; F. A. Peirson; F. C. Edwards; F. C. Morgan; FBC; First Baptist Church of Oviedo; Florida Mosquito Territory; Fort Christmas; Fort Drum; Fort Gatlin; Freeze of 1894; freezes; G. W. Alford; Goldenrod Baptist churches; Groveland; groves; growers; H. B. McCall; H. H. Link; Hammond organ; Henry Walcott; Homecoming Day; Howard S. Gott; Indian; Iniah Honchin; Ira Rouse; Isaacs; J. A. Richardson; J. B. Rogers; J. C. Hatlzelow; J. E. Okerlund; J. F. Mitchell; J. G. Black; J. H. King; J. H. Lee, Sr.; J. I.; J. I. Beasley; J. M. Jones; J. M. Kones; J. Max Cook; J. N. Thompson; J. O. Fries; J. O. Jelks; J. P. Jacobs; J. S. Day; J. T. Bryant; J. T. Wheeler; J. W. Martin; Jack T. Bryant; James G. Speer; Jelks; Joe Fox; Joe Leinhart; John Hiram Lee, Sr.; John M. Camp; John S. Womble; Joseph Leinhart; Joshua P. Jacobs; Julia Golden; K. Swonson; L. A. Hardy; L. L. Day; Ladies Aid Society; Lake Charm; Lake Jessup Avenue; Lake Jessup Community; Lake Jessup Settlement; Lake Jesup; Lawton; Lois Ruddell; Lord; Lund; M. E. Brock; Magazine Club of Oviedo; Maitland; Mary Gwynn; Mary Jacobs; Mary Walker; Milton Gore; Missionary Baptist churches; Mosquito County; Muskogan; Native American; Needham Jelks; Nelson; Nelson Brothers; Nettie Aulin; Nettie Jacobs; Nettie Jacobs Aulin; O. M.; orange county; Orange Grove Baptist Church; oranges; organ; orlando; Oviedo; Oviedo Baptist churches; P. H. Brown; pastor; Pearl G. Martin; Pride of Oviedo; R. L. Ward; R. L. Wheeler; R. M. Hickman; R. W. Dickert; R. W. Lawton; religious education; Reminiscence Fair; reverend; Robert Lawton; S. C. Dorsey; S. W. Sheffield; schools; Seminole; Seminole County; Sexton; shipping; slave; slavery; Solaria's Wharf; St. Johns River; St. Volusia; Statson University; Sunday schools; T. H. Daniell, Sr.; T. J. Bell; T. W. Lawton; Ted Aulin; The Lodge; Theodore Aulin; Theodore Aulin, Jr.; Theodore Aulin, Sr.; Thomas Willington Lawton; Tom Lawton; Tom Wheeler; Tomokan; Tucker; Tuscovilla; W. A. Jelks; W. A. Ward, Jr.; W. E. Alexander; W. G. Powell; W. H. Luther; W. H. Martin; W. J. Lawton, Sr.; W. P. Carter; W. P. Rogers; W. S. Sommerville; W. T. Walker; W. W. Townson; Walter Gwynn; Whitney-Wolcott House; Will Alexander; William Clevor; William H. Martin; Williams Stones; Winborn Joseph Lawton, Sr.